There has been a fall in participation at investor events for Asian companies over the past year, according to the IR Magazine Global Investor Relations Practice Report 2016. Asian IR teams dropped their average number of roadshows from 6.1 in 2015 to 5.1 last year. Despite this, the region’s IR departments managed to almost maintain the same number of days on the road at 13.3, down just 0.2 on 2015. These numbers are the lowest of the three regions measured, with North American firms spending an average 13.9 days on the road spread across 6.7 roadshows in 2016. It is companies in Europe, however, that take the top spot, with an average of 10.7 roadshows over the year and 16.5 days spent on the road. Back in Asia, investor conferences and site visits have also seen a fall in IR participation, while Asian companies have hosted, on average, half a site visit less in 2016 than they did in 2015. Despite these falls, Asian companies still attend more investor conferences and host more site visits than companies from any other region. 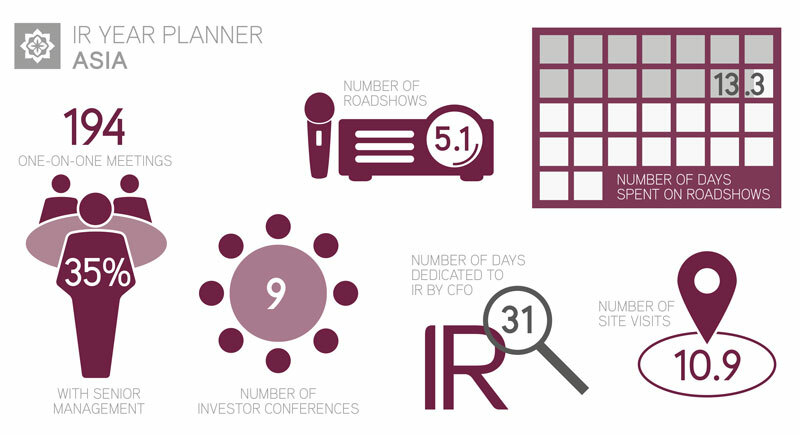 Click here to download the IR Magazine Global Investor Relations Practice Report 2016.